We’re going to talk about religion. I know, it’s been awhile, and I’ve since moved on to lighter subjects but this post is long overdue. We need to talk about Jesus. Why Jesus and why now? 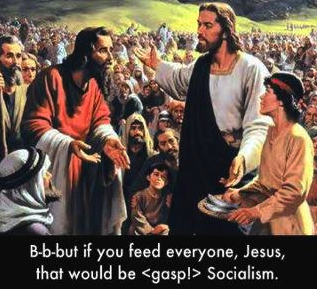 A Twitter rant this morning by an ill- informed, angry “Hate everything but God,” Christian named Joe got me thinking about socialism and “Free Enterprise” (apparently Joe can’t spell capitalism) and how these two economic systems relate to those who profess to follow Jesus. For people like Joe “Socialism is a failed system” while the Bible “ Is for “Free Enterprise” (by the way, I looked this quote up in the Bible, but cannot find it. Joe may have a very modern translation). To be fair to Joe, he is partly right, strict socialist economies are failing, but so are capitalistic (sorry, free enterprise) systems; it’s a wonder, given that Joe lives in America, he does not recognize this. But let’s back to the root of Joe’s rant. As a Christian (I use this term loosely to describe Joe-who hates everything) Joe seems to be under the impression that Jesus wants us to be rich (and apparently white, going by his Twitter feed) but fails to take in consideration that the Biblical Jesus was very much against the wealthy and did what he could to change the social system of his day. Those who are truly Christians should know this. I give you six reasons why Jesus was a socialist *Hippie. *The love everyone kind, not the take drugs kind. Not only did Jesus have some clear views on wealth, he tended to see possessions as obstacles of faith. I could go on, but you get the idea. Jesus was not big on wealth or material goods; two things every capitalist (sorry again, free enterpriser) worships. For those of you who do not know the story, here it is in a nutshell. One day while walking along the Sea of Galilee Jesus noticed two fishermen and called for them to follow him. Oddly enough, they shrugged their shoulders, put down their nets and followed him. It may have helped that a crowd was already following and they may have thought, “Why not, beats fishing”. Jesus saw two more men near boats and asked if could join them. He got on the boat, gave a quick sermon, waved his staff (sorry, that was Gandalf) and magically miraculously, filled the boat with fish. Now, if he was a free enterpriser, you’d think he’d of gotten off the boat and yelled at the two fishermen, “When you sells this haul, remember I get a cut of the profits”. But no, the two men got off the boat with him, never to return. As they walked Jesus said, “Don’t be afraid, now you will catch men” Luke 5:11. We have to assume the crowd ate the fish and the phrase “catch men” was explained more thoroughly later. Now, you’d think if Jesus was all for free enterprise, he’d cut some sort of deal with a local restaurant when he had crowds of hungry people gathered to hear him speak. This would have surely helped the local economy. After all, whenever there is a convention in town, the locals cash in. Once again, Jesus ignores the capitalist tendencies to see a golden opportunity at every turn. Instead, he performs another trick, miracle and turns water to wine (you can start to understand why the local government may have been unhappy with him). No one pays for anything. In fact, the limited amount of food that is brought to the gathering is multiplied so that everyone has something to eat. Actually, the Bible says nothing about where Jesus lived on a day-to-day basis. But we do know he always had at least 12 men with him, none of which had day jobs at this point. It is safe to assume he did not live a well-furnished house. We do know however, that well after his death, many followers of the faith lived and worked together, sharing what they had. Time and time again we see Christian sects living together as one big happy family. In fact, it could be argued that the Puritans, while not politically but socially, experimented with socialism. From leaving England to form their own society, to sharing material goods, the Puritans became examples for other later small American socialist societies. Was for love, not hate. Speaking of communes, remember the 60’s? A time when young people wanted to live together in peace and harmony? Well, they got a lot of that from Jesus. He has many things to say about the meek, loving your neighbor, turning the other check and not judging others. He was in all sense a true spiritual hippie on this point. People like Joe, tend to forget this. While I could call him out on this by giving you his Twitter handle I won’t. I am better than this. I don’t want anyone harassing the poor fool. He has enough problems. Joe hates the president: evolution: socialism: atheism and science. He is one big ball of anger. I almost feel sorry for him and those just like him. But the next time you run into a free enterprising loving yet hating everything else, Christian, remind them Jesus was a socialist hippie. By the way, some of you may be offend or want to argue semantics. To you I say, Get over yourself. This is a humors approach to the very ugly topic of religious hypocrisy. I find the overlap between Christians and Objectivists (followers of Ayn Rand and her version of libertarianism) particularly funny, given how much Rand disliked Christianity. Oh no doubt Calvinism spurred the spirit of industry. Though I wonder what Calvin would say about the “everyman for himself” aspect of today’s capitalism. We have moved very far from gaining wealth and remembering to help the poor, to “what the heck do I have to do with these dirty people?”. Jesus may have been successful (though I would credit Paul for being a great PR man) but not financially successful as many of his modern followers so desperately want. Calvin would disapprove, since wealth is a blessing conferred on one by God, sometimes, for carrying out one’s vocation as set by God. It is merely a sign of worth, if gotten through one’s own efforts, not an end. Next Next post: Ice Bucket Challenge accepted!